Steganography - There's always a simple way to do it. Steganography is the way of hiding crucial or secret informations. In computer terms, it's known as or popular for hiding text files into image photo files. So, when newbie opens an image files, he/she sees nothing but image file but it's only you, who could see the ALL THE SECRET INFORMATIONS put up into it. YOU DON'T NEED TO USE PROFESSIONAL SOFTWAREs to hide your informations into an Image file. There's always a simple way to do complex things. Today, i'm going to show the same simple method you can execute using some simple techniques. 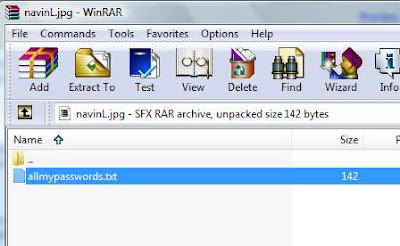 * Winrar(unzipping tool) - I use Winrar because, it's better than any other zipping/unzipping utility. Better?? the compression rate is higher, that's the deal. I'm using Vista home premium, this trick works in Vista. In windows XP, i've been using this all the time. 1. 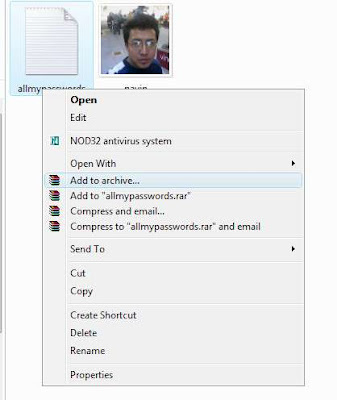 Lets create a folder - C:\hide and copy image and txt file into that folder. 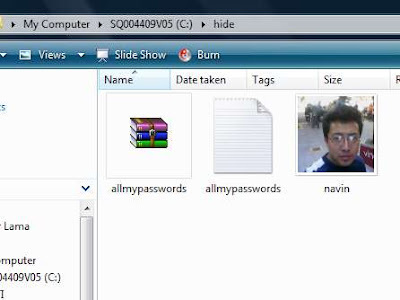 As for this example, i copied navin.jpg and allmypasswords.txt to C:\hide folder. 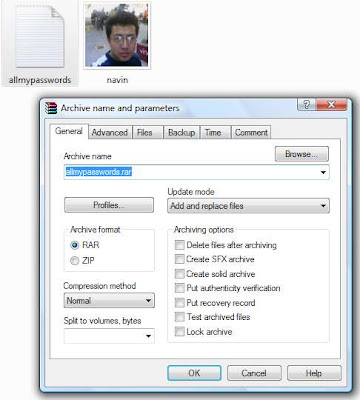 navin.jpg is my normal photo and allmypasswords.txt supposedly contains all my passwords and confidential informations in it. Click Ok when prompted. And you just created an archive of the txt file. 3. Now we've three files. 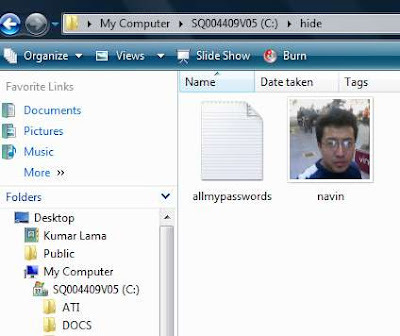 what this command does is, it creates new image file navinL.jpg where allmypasswords.rar file is included and hidden. You can give any name for new jpg file. I just gave 'navinL' as new name. If you check the size of new file with older file, there is a change in size. 6. Now, open new image file navinL.jpg. It would simply open as Image file. WHAO.. but what about viewing the hidden files inside that image. It's not still the safest way, but you can encrypt the archive files with password(inside winrar). If it's very sensitive. And, there are some other ways to safeguard your stuffs. Like changing extension of confidential files to some other extensions. Like changing documents files to system file extention eg. dll or jpg. You can do anything like changing extensions. Hope this trick saves your time and secret stuffs from prying eyes.